Aerial view of HAARP taken 1998 Background of the HAARP Project Prepared by Rosalie Bertell, Ph.D., GNSH Military interest in space became intense during and after World War II because of the introduction of rocket science, the companion to nuclear technology. The early versions include the buzz bomb and guided missiles. They were thought of as potential carriers of both nuclear and conventional bombs. Rocket technology and nuclear weapon technology developed simultaneously between 1945 and 1963. During this time of intensive atmospheric nuclear testing, explosions at various levels above and below the surface of the earth were attempted. Some of the now familiar descriptions of the earth's protective atmosphere, such as the existence of the Van Allen belts, were based on information gained through stratospheric and ionospheric experimentation. The earth's atmosphere consists of the troposphere, from sea level to about 16 km above the earth's surface; the stratosphere (which contains the ozone level) which extends from about the 16 to 48 km above the earth; and the ionosphere which extends from 48 km to over 50,000 km above the surface of the earth. The earth's protective atmosphere or "skin" extends beyond 3,200 km above sea level to the large magnetic fields, called the Van Allen Belts, which can capture the charged particles sprayed through the cosmos by the solar and galactic winds. These belts were discovered in 1958 during the first weeks of the operation of America's first satellite, Explorer I. They appear to contain charged particles trapped in the earth's gravity and magnetic fields. Primary galactic cosmic rays enter the solar system from interstellar space, and are made up of protons with energies above 100 MeV, extending up to astronomically high energies. They make up about 100 percent of the high energy rays. Solar rays are generally of lower energy, below 20 MeV (which is still high energy in earth terms). These high energy particles are affected by the earth's magnetic field and by geomagnetic latitude (distance above or below the geomagnetic equator). The flux density of low energy protons at the top of the atmosphere is normally greater at the poles than at the equator. The density also varies with solar activity, being at a minimum when solar flares are at a minimum. The Van Allen belts capture charged particles (protons, electrons and alpha particles) and these spiral along the magnetic force lines toward the polar regions where the force lines converge. They are reflected back and forth between the magnetic force lines near the poles. The lower Van Allen Belt is about 7700 km above the earth's surface, and the outer Van Allen Belt is about 51,500 km above the surface. According to the Encyclopedia Britannica, the Van Allen belts are most intense along the equator, and effectively absent over the poles. They dip to 400 km over the South Atlantic Ocean, and are about 1,000 km high over the Central Pacific Ocean. In the lower Van Allen Belt, the proton intensity is about 20,000 particles with energy above 30 MeV per second per square centimeter. Electrons reach a maximum energy of 1 MeV, and their intensity has a maximum of 100 million per second per square centimeter. In the outer Belt, proton energy averages only 1 MeV. For compar-ison, most charged particles discharged in a nuclear explosion range between 0.3 and 3 MeV, while diagnostic medical X- ray has peak voltage around 0.5 MeV. Project Argus (1958) Between August and September 1958, the US Navy exploded three fission type nuclear bombs 480 km above the South Atlantic Ocean, in the part of the lower Van Allen Belt closest to the earth's surface. In addition, two hydrogen bombs were detonated 160 km over Johnston Island in the Pacific. The military called this "the biggest scientific experiment ever undertaken." It was designed by the US Department of Defense and the US Atomic Energy Commission, under the code name Project Argus. The purpose appears to be to assess the impact of high altitude nuclear explosions on radio transmission and radar operations because of the electromagnetic pulse (EMP), and to increase understanding of the geomagnetic field and the behavior of the charged particles in it. This gigantic experiment created new (inner) magnetic radiation belts encompassing almost the whole earth, and injected sufficient electrons and other energetic particles into the ionosphere to cause world wide effects. The electrons traveled back and forth along magnetic force lines, causing an artificial "aurora" when striking the atmosphere near the North Pole. The US Military planned to create a "telecommunications shield" in the ionosphere, reported in 13-20 August 1961, Keesings Historisch Archief (K.H.A.). This shield would be created "in the ionosphere at 3,000 km height, by bringing into orbit 350,000 million copper needles, each 2-4 cm long [total weight 16 kg], forming a belt 10 km thick and 40 km wide, the needles spaced about 100 m apart." This was designed to replace the ionosphere "because telecommunications are impaired by magnetic storms and solar flares." The US planned to add to the number of copper needles if the experiment proved to be successful. This plan was strongly opposed by the Intentional Union of Astronomers. Project Starfish (1962) On July 9, 1962, the US began a further series of experiments with the ionosphere. From their description: "one kiloton device, at a height of 60 km and one megaton and one multi-megaton, at several hundred kilometers height" (K.H.A., 29 June 1962). These tests seriously disturbed the lower Van Allen Belt, substantially altering its shape and intensity. "In this experiment the inner Van Allen Belt will be practically destroyed for a period of time; particles from the Belt will be transported to the atmosphere. It is anticipated that the earth's magnetic field will be disturbed over long distances for several hours, preventing radio communication. The explosion in the inner radiation belt will create an artificial dome of polar light that will be visible from Los Angeles" (K.H.A. 11 May 1962). A Fijian Sailor, present at this nuclear explosion, told me that the whole sky was on fire and he thought it would be the end of the world. This was the experiment which called forth the strong protest of the Queen's Astronomer, Sir Martin Ryle in the UK. The ionosphere [according to the under-standing at that time] that part of the atmosphere between 65 and 80 km and 280- 320 km height, will be disrupted by mechanical forces caused by the pressure wave following the explosion. At the same time, large quantities of ionizing radiation will be released, further ionizing the gaseous components of the atmosphere at this height. This ionization effect is strengthened by the radiation from the fission products... The lower Van Allen Belt, consisting of charged particles that move along the geomagnetic field lines... will similarly be disrupted. As a result of the explosion, this field will be locally destroyed, while countless new electrons will be introduced into the lower belt" (K.H.A. 11 May 1962). "On 19 July... NASA announced that as a consequence of the high altitude nuclear test of July 9, a new radiation belt had been formed, stretching from a height of about 400 km to 1600 km; it can be seen as a temporary extension of the lower Van Allen Belt" (K.H.A. 5 August 1962). As explained in the Encyclopedia Britannica: "... Starfish made a much wider belt [than Project Argus] that extends from low altitude out past L=3 [i.e. three earth radiuses or about 13,000 km above the surface of the earth]." Later in 1962, the USSR undertook similar planetary experiments, creating three new radiation belts between 7,000 and 13,000 km above the earth. According to the Encyclopedia, the electron fluxes in the lower Van Allen Belt have changed markedly since the 1962 high- altitude nuclear explosions by the US and USSR, never returning to their former state. According to American scientists, it could take many hundreds of years for the Van Allen Belts to destabilize at their normal levels. (Research done by: Nigel Harle, Borderland Archives, Cortenbachstraat 32, 6136 CH Sittard, Netherlands.) SPS: Solar Power Satellite Project (1968) In 1968 the US military proposed Solar Powered Satellites in geostationary orbit some 40,000 km above the earth, which would intercept solar radiation using solar cells on satellites and transmit it via a microwave beam to receiving antennas, called rectennas, on earth. The US Congress mandated the Department of Energy and NASA to prepare an Environmental Impact Assessment on this project, to be completed by June 1980, and costing $25 Million. This project was designed to construct 60 Solar Powered Satellites over a thirty year period at a cost between $500 and $800 thousand million (in 1968 dollars), providing 100 percent of the US energy needs in the year 2025 at a cost of $3000 per kW. At that time, the project cost was two to three times larger than the whole Department of Energy budget, and the projected cost of the electricity was well above the cost of most conventional energy sources. The rectenna sites on earth were expected to take up to 145 square kilometers of land, and would preclude habitation by any humans, animals or even vegetation. Each Satellite was to be the size of Manhattan Island. Saturn V Rocket (1975) Due to a malfunction, the Saturn V Rocket burned unusually high in the atmosphere, above 300 km. This burn produced "a large ionospheric hole" (Mendillo, M. Et al., Science p. 187, 343, 1975). The disturbance reduced the total electron content more than 60% over an area 1,000 km in radius, and lasted for several hours. It prevented all telecommunications over a large area of the Atlantic Ocean. The phenomenon was apparently caused by a reaction between the exhaust gases and ionospheric oxygen ions. The reaction emitted a 6300 A airglow. Between 1975 and 1981 NASA and the US Military began to design ways to test this new phenomena through deliberate experimentation with the ionosphere. SPS Military Implications (1978) Early review of the Solar Powered Satellite Project began in around 1978, and I was on the review panel. Although this was proposed as an energy program, it had significant military implications. One of the most significant, first pointed out by Michael J. Ozeroff, was the possibility of developing a satellite-borne beam weapon for anti-ballistic missile (ABM) use. The satellites were to be in geosynchronous orbits, each providing an excellent vantage point from which an entire hemisphere can be surveyed continuously. It was speculated that a high-energy laser beam could function as a thermal weapon to disable or destroy enemy missiles. There was some discussion of electron weapon beams, through the use of a laser beam to preheat a path for the following electron beam. The SPS was also described as a psychological and anti- personnel weapon, which could be directed toward an enemy. If the main microwave beam was redirected away from its rectenna, toward enemy personnel, it could use an infrared radiation wave- length (invisible) as an anti-personnel weapon. It might also be possible to transmit high enough energy to ignite combustible materials. Laser beam power relays could be made from the SPS satellite to other satellites or platforms, for example aircraft, for military purposes. One application might be a laser powered turbofan engine which would receive the laser beam directly in its combustion chamber, producing the required high temperature gas for its cruising operation. This would allow unlimited on-station cruise time. As a psychological weapon, the SPS was capable of causing general panic The SPS would be able to transmit power to remote military operations anywhere needed on earth. The manned platform of the SPS would provide surveillance and early warning capability, and ELF linkage to submarines. It would also provide the capability of jamming enemy communications. The potential for jamming and creating communications is significant. The SPS was also capable of causing physical changes in the ionosphere President Carter approved the SPS Project and gave it a go- ahead, in spite of the reservation which many reviewers, myself included, expressed. Fortunately, it was so expensive, exceeding the entire Department of Energy budget, that funding was denied by the Congress. I approached the United Nations Committee on Disarmament on this project, but was told that as long as the program was called Solar Energy by the United States, it could not be considered a weapons project. The same project resurfaced in the US under President Reagan. He moved it to the much larger budget of the Department of Defense and called it Star Wars. Since this is more recent history, I will not discuss the debate which raged over this phase of the plan. By 1978, it was apparent to the US Military that communications in a nuclear hostile environment would not be possible using traditional methods of radio and television technology (Jane's Military Communications 1978). By 1982, GTE Sylvania (Needham Heights, Massachusetts) had developed a command control electronic sub-system for the US Air Force's Ground Launch Cruise Missiles (GLCM) that would enable military commanders to monitor and control the missile prior to launch both in hostile and non-hostile environments. The system contains six radio subsystems, created with visible light using a dark beam (not visible) and is resistant to the disruptions experienced by radio and television. Dark beams contribute to the formation of energetic plasma in the atmosphere. This plasma can become visible as smog or fog. Some has a different charge than the sun's energy, and accumulates in places where the sun's energy is absent, like the polar regions in the winter. When the polar spring occurs, the sun appears and repels this plasma, contributing to holes in the ozone layer. This military system is called: Ground Wave Emergency Network (GWEN). (See The SECOMII Communication System, by Wayne Olsen, SAND 78- 0391,Sandia Laboratories, Albuquerque, New Mexico, April 1978.) This innovative emergency radio system was apparently never implemented in Europe, and exists only in North America. Orbit Maneuvering System (1981) Part of the plan to build the SPS space platforms was the demand for reusable space shuttles, since they could not afford to keep discarding rockets. The NASA Spacelab 3 Mission of the Space Shuttle made, in 1981, "a series of passes over a network of five ground based observatories" in order to study what happened to the ionosphere when the Shuttle injected gases into it from the Orbit Maneuvering System (OMS). They discovered that they could "induce ionospheric holes" and began to experiment with holes made in the daytime, or at night over Millstone, Connecticut, and Arecibo, Puerto Rico. They experimented with the effects of "artificially induced ionospheric depletions on very low frequency wave lengths, on equatorial plasma instabilities, and on low frequency radio astronomical observations over Roberval, Quebec, Kwajelein, in the Marshall Islands and Hobart, Tasmania" (Advanced Space Research, Vo1.8, No. 1, 1988). Innovative Shuttle Experiments (1985) An innovative use of the Space Shuttle to perform space physics experiments in earth orbit was launched, using the OMS injections of gases to "cause a sudden depletion in the local plasma concentration, the creation of a so called ionospheric hole." This artificially induced plasma depletion can then be used to investigate other space phenomena, such as the growth of the plasma instabilities or the modification of radio propagation paths. The 47 second OMS burn of July 29, 1985, produced the largest and most long-lived ionospheric hole to date, dumping some 830 kg of exhaust into the ionosphere at sunset. A 6 second, 68 km OMS release above Connecticut in August 1985, produced an airglow which covered over 400,000 square km. During the 1980's, rocket launches globally numbered about 500 to 600 a year, peaking at 1500 in 1989. There were many more during the Gulf War. The Shuttle is the largest of the solid fuel rockets, with twin 45 meter boosters. All solid fuel rockets release large amounts of hydrochloric acid in their exhaust, each Shuttle flight injecting about 75 tons of ozone destroying chlorine into the stratosphere. Those launched since 1992 inject even more ozone-destroying chlorine, about 187 tons, into the stratosphere (which contains the ozone layer). Mighty Oaks (1986) In April 1986, just before the Chernobyl disaster, the US had a failed hydrogen test at the Nevada Test Site called Mighty Oaks. This test, conducted far underground, consisted of a hydrogen bomb explosion in one chamber, with a leaded steel door to the chamber, two meters thick, closing within milliseconds of the blast. The door was to allow only the first radioactive beam to escape into the "control room" in which expensive instrumentation was located. The radiation was to be captured as a weapon beam. The door failed to close as quickly as planned, causing the radioactive gases and debris to fill the control room, destroying millions of dollars worth of equipment. The experiment was part of a program to develop X-ray and particle beam weapons. The radioactive releases from Mighty Oaks were vented, under a "licensed venting" and were likely responsible for many of the North American nuclear fallout reports in May 1986, which were attributed to the Chernobyl disaster. Desert Storm (1991) According to Defense News, April 13 - 19, 1992, the US deployed an electromagnetic pulse weapon (EMP) in Desert Storm, designed to mimic the flash of electricity from a nuclear bomb. The Sandia National Laboratory had built a 23,000 square meter laboratory on the Kirkland Air Force Base, 1989, to house the Hermes II electron beam generator capable of producing 20 Trillion Watt pulses lasting 20 billionths to 25 billionths of a second. This X-ray simulator is called a Particle Beam Fusion Accelerator. A stream of electrons hitting a metal plate can produce a pulsed X-ray or gamma ray. Hermes II had produced electron beams since 1974. These devises were apparently tested during the Gulf War, although detailed information on them is sparse. High Frequency Active Auroral Research Program, HAARP (1993) The HAARP Program is jointly managed by the US Air Force and the US Navy, and is based in Gakona, Alaska. It is designed to "understand, simulate and control ionospheric processes that might alter the performance of communication and surveillance systems." The HAARP system intends to beam 3.6 Gigawatts of effective radiated power of high frequency radio energy into the ionosphere in order to: Generate extremely low frequency (ELF) waves for communicating with submerged submarines Conduct geophysical probes to identify and characterize natural ionospheric processes so that techniques can be developed to mitigate or control them Generate ionospheric lenses to focus large amounts of high frequency energy, thus providing a means of triggering ionospheric processes that potentially could be exploited for Department of Defense purposes, Electron acceleration for infrared (IR) and other optical emissions which could be used to control radio wave propagation properties Generate geomagnetic field aligned ionization to control the reflection/scattering properties of radio waves, Use oblique heating to produce effects on radio wave propagation, thus broadening the potential military applications of ionospheric enhancement technology. Poker Flat Rocket Launch (1968 to Present) The Poker Flat Research Range is located about 50 km North of Fairbanks, Alaska, and it was established in 1968. It is operated by the Geophysical Institute with the University of Alaska Fairbanks, under NASA contract. About 250 major rocket launches have taken place from this site, and in 1994, a 16 meter long rocket was launched to help NASA "understand chemical reactions in the atmosphere associated with global climate change." Similar experiments, but using Chemical Release Modules (CRM), have been launched from Churchill, Manitoba. In 1980, Brian Whelan's "Project Waterhole" disrupted an aurora borealis, bringing it to a temporary halt. In February 1983, the chemical released into the ionosphere caused an aurora borealis over Churchill. In March 1989, two Black Brant X's and two Nike Orion rockets were launched over Canada, releasing barium at high altitudes and creating artificial clouds. These Churchill artificial clouds were observed from as far away as Los Alamos, New Mexico. The US Navy has also been carrying on High Power Auroral Stimulation (HIPAS) research in Alaska. Through a series of wires and a 15 meter antenna, they have beamed high intensity signals into the upper atmosphere, generating a controlled disturbance in the ionosphere. As early as 1992, the Navy talked of creating 10 kilometer long antennas in the sky to generate extremely low frequency (ELF) waves needed for communicating with submarines. Another purpose of these experiments is to study the Aurora Borealis, called by some an outdoor plasma lab for studying the principles of fusion. Shuttle flights are now able to generate auroras with an electron beam. On November 10, 1991, and aurora borealis appeared in the Texas sky for the first time ever recorded, and it was seen by people as far away as Ohio and Utah, Nebraska and Missouri. The sky contained "Christmas colors" and various scientists were quick to blame it on solar activity. However, when pressed most would admit that the ionosphere must have been weakened at the time, so that the electrically charged particle hitting the earth's atmosphere created the highly visible light called airglow. These charged particles are normally pulled northwards by the earth's magnetic forces, to the magnetic north pole. The Northern Lights, as the aurora borealis is called, normally occurs in the vortex at the pole where the energetic particles, directed by the magnetic force lines, are directed. Conclusions it would be rash to assume that HAARP is an isolated experiment which would not be expanded. It is related to fifty years of intensive and increasingly destructive programs to understand and control the upper atmosphere. It would be rash not to associate HAARP with the space laboratory construction which is separately being planned by the United States. HAARP is an integral part of a long history of space research and development of a deliberate military nature. The military implications of combining these projects is alarming. Basic to this project is control of communications, both disruption and reliability in hostile environments. The power wielded by such control is obvious. The ability of the HAARP / Spacelab/ rocket combination to deliver very large amount of energy, comparable to a nuclear bomb, anywhere on earth via laser and particle beams, are frightening. The project is likely to be "sold" to the public as a space shield against incoming weapons, or, for the more gullible, a devise for repairing the ozone layer. Further References: C.L. Herzenberg, Physics and Society, April 1994. R. Williams, Physics and Society, April 1988. B. Eastlund, Microwave News, May/June 1994. W. Kofinan and C. Lathuillere, Geophysical Research Letters, Vol 14, No. 11, pp 1158-1161, November 1987 (Includes French experiments at EISCAT). G. Metz and F.W. Perkins. Ionospheric Modification Theory: Past Present and Future, Radio Science, Vo1.9, No. 11, pp 885 -888, November 1974. Techno-Net is the protest form of the 1990s -- picketing on the information highways. For example, a fast-growing assortment of men and women around the world are using the InterNet (started by the U.S. military for information transfer-and-exchange that would never be interfered with) to draw attention to a questionable military project in Alaska. Now these InterNetting, e-mailing, faxing folks are blowing holes in the Department of Defense secrecy wall, by using the government's own system. The printed-word part of the protest started when Dennis Specht, an anti-nuclear activist then living in Alaska, sent a news item to Nexus on the topic of HAARP --- the High frequency Active Auroral Research Program. Then an Alaskan political activist and science researcher in Anchorage, Nick Begich, networked with Patrick and Gael Crystal Flanagan, who are self-described TechnoMonks living in Sedona, Arizona, and was told to check out that same Australian-based magazine. Begich was surprised to see an item from his hometown in Nexus, and immediately headed to the local library to dig out the documents cited in the article. That research led to articles and the book, Angels Don't Play this HAARP: Advances in Tesla Technology, which is 230 pages of detailed information on this intrusive project. This article will only give highlights. Despite the amount of research (350 footnotes), at its heart it is a story about ordinary people who took on an extraordinary challenge. HAARP Boils The Upper Atmosphere HAARP will zap the upper atmosphere with a focused and steerable electromagnetic beam. It is an advanced model of an "ionospheric heater". (The ionosphere is the electrically-charged sphere surrounding Earth's upper atmosphere. It ranges between about 40- to 600 miles above Earth's surface.) Put simply, the apparatus for HAARP is a reversal of a radio telescope; antennas send out signals instead of receiving. HAARP is the test run for a super-powerful radiowave-beaming technology that lifts areas of the ionosphere by focusing a beam and heating those areas. Electromagnetic waves then bounce back onto earth and penetrate everything -- living and dead. HAARP publicity gives the impression that the High-frequency Active Auroral Research Program is mainly an academic project with the goal of changing the ionosphere to improve communications for our own good. However, other U.S. military documents put it more clearly -- HAARP aims to learn how to "exploit the ionosphere for Department of Defense purposes". Communicating with submarines is only one of those purposes. Press releases and other information from the military on HAARP continually downplay what it could do. 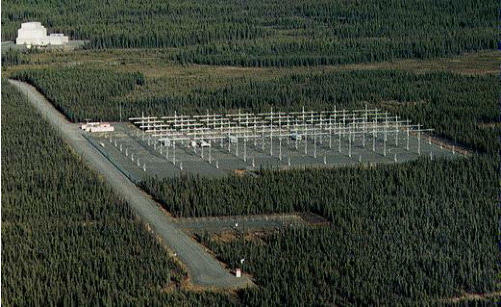 Publicity documents insist that the HAARP project is no different than other ionospheric heaters operating safely throughout the world in places such as Arecibo, Puerto Rico; Tromso, Norway and the former Soviet Union. However, a 1990 government document indicates that the radio-frequency (RF) power zap will drive the ionosphere to unnatural activities. at the highest HF powers available in the West, the instabilities commonly studied are approaching their maximum RF energy dissipative capability, beyond which the plasma processes will 'runaway' until the next limiting factor is reached." If the military, in cooperation with the University of Alaska Fairbanks, can show that this new ground-based "Star Wars" technology is sound, they both win. The military has a relatively-inexpensive defense shield and the University can brag about the most dramatic geophysical manipulation since atmospheric explosions of nuclear bombs. After successful testing, they would have the military megaprojects of the future and huge markets for Alaska's North Slope natural gas. Looking at the other patents which built on the work of a Texas' physicist named Bernard Eastlund, it becomes clearer how the military intends to use the HAARP transmitter. It also makes governmental denials less believable. The military knows how it intends to use this technology, and has made it clear in their documents. The military has deliberately misled the public, through sophisticated word games, deceit and outright disinformation. The military says the HAARP system could: give the military a tool to replace the electromagnetic pulse effect of atmospheric thermonuclear devices (still considered a viable option by the military through at least 1986). replace the huge Extremely Low Frequency (ELF) submarine communication system operating in Michigan and Wisconsin with a new and more compact technology. Be used to replace the over-the-horizon radar system that was once planned for the current location of HAARP, with a more flexible and accurate system. provide a way to wipe out communications over an extremely large area, while keeping the military's own communications systems working. provide a wide area earth-penetrating tomography which, if combined with the computing abilities of EMASS and Cray computers, would make it possible to verify many parts of nuclear nonproliferation and peace agreements. be a tool for geophysical probing to find oil, gas and mineral deposits over a large area. be used to detect incoming low-level planes and cruise missiles, making other technologies obsolete. The above abilities seem like a good idea to all who believe in sound national defense, and to those concerned about cost-cutting. However, the possible uses which the HAARP records do not explain, and which can only be found in Air Force, Army, Navy and other federal agency records, are alarming. Moreover, effects from the reckless use of these power levels in our natural shield - the ionosphere - could be cataclysmic according to some scientists. Two Alaskans put it bluntly. A founder of the NO HAARP movement, Clare Zickuhr, says "The military is going to give the ionosphere a big kick and see what happens." The military failed to tell the public that they do not know what exactly will happen, but a Penn State science article brags about that uncertainty. Macho science? The HAARP project uses the largest energy levels yet played with by what Begich and Manning call "the big boys with their new toys". It is an experiment on the sky, and experiments are done to find out something not already known. Independent scientists told Begich and Manning that a HAARP-type "skybuster" with its unforeseen effects could be an act of global vandalism. The patents described below were the package of ideas which were originally controlled by ARCO Power Technologies Incorporated (APTI), a subsidiary of Atlantic Richfield Company, one of the biggest oil companies in the world. APTI was the contractor that built the HAARP facility. ARCO sold this subsidiary, the patents and the second phase construction contract to E-Systems in June 1994. E-Systems is one of the biggest intelligence contractors in the world -- doing work for the CIA, defense intelligence organizations and others. $1.8 billion of their annual sales are to these organizations, with $800 million for black projects -- projects so secret that even the United States Congress isn't told how the money is being spent. E-Systems was bought out by Raytheon, which is one of the largest defense contractors in the world. In 1994 Raytheon was listed as number forty-two on the Fortune 500 list of companies. Raytheon has thousands of patents, some of which will be valuable in the HAARP project. The twelve patents below are the backbone of the HAARP project, and are now buried among the thousands of others held in the name of Raytheon. Bernard J. Eastlund's U.S. Patent # 4,686,605 , "Method and Apparatus for Altering a Region in the Earth's Atmosphere, Ionosphere, and/or Magnetosphere" was sealed for a year under a government Secrecy Order. The Eastlund ionospheric heater was different; the radio frequency (RF) radiation was concentrated and focused to a point in the ionosphere. This difference throws an unprecedented amount of energy into the ionosphere. The Eastlund device would allow a concentration of one watt per cubic centimeter, compared to others only able to deliver about one millionth of one watt. This huge difference could lift and change the ionosphere in the ways necessary to create futuristic effects described in the patent. According to the patent, the work of Nikola Tesla in the early 1900's formed the basis of the research. What would this technology be worth to ARCO, the owner of the patents? They could make enormous profits by beaming electrical power from a powerhouse in the gas fields to the consumer without wires. For a time, HAARP researchers could not prove that this was one of the intended uses for HAARP. In April, 1995, however, Begich found other patents, connected with a "key personnel" list for APTI. Some of these new APTI patents were indeed a wireless system for sending electrical power. Eastlund's patent said the technology can confuse or completely disrupt airplanes' and missiles' sophisticated guidance systems. Further, this ability to spray large areas of Earth with electromagnetic waves of varying frequencies, and to control changes in those waves, makes it possible to knock out communications on land or sea as well as in the air. The patent said: "Thus, this invention provides the ability to put unprecedented amounts of power in the Earth's atmosphere at strategic locations and to maintain the power injection level, particularly if random pulsing is employed, in a manner far more precise and better controlled than heretofore accomplished by the prior art, particularly by detonation of nuclear devices of various yields at various altitudes..." it is possible not only to interfere with third party communications but to take advantage of one or more such beams to carry out a communications network even though the rest of the world's communications are disrupted. Put another way, what is used to disrupt another's communications can be employed by one knowledgeable of this invention as a communication network at the same time." large regions of the atmosphere could be lifted to an unexpectedly high altitude so that missiles encounter unexpected and unplanned drag forces with resultant destruction ... " Weather modification is possible by, for example, altering upper atmosphere wind patterns by constructing one or more plumes of atmospheric particles which will act as a lens or focusing device. ... molecular modifications of the atmosphere can take place so that positive environmental effects can be achieved. Besides actually changing the molecular composition of an atmospheric region, a particular molecule or molecules can be chosen for increased presence. For example, ozone, nitrogen, etc., concentrations in the atmosphere could be artificially increased... Begich found eleven other APTI patents. They told how to make Nuclear-sized Explosions without Radiation", power-beaming systems, over- the-horizon radar, detection systems for missiles carrying nuclear warheads, electromagnetic pulses previously produced by thermonuclear weapons and other Star-Wars tricks. This cluster of patents underlay the HAARP weapon system. Related research by Begich and Manning uncovered bizarre schemes. For example, Air Force documents revealed that a system had been developed for manipulating and disrupting human mental processes through pulsed radio-frequency radiation (the stuff of HAARP) over large geographical areas. The most telling material about this technology came from writings of Zbigniew Brzezinski (former National Security Advisory to U.S. President Carter) and J.F. MacDonald (science advisor to U.S. President Johnson and a professor of Geophysics at UCLA), as they wrote about use of power-beaming transmitters for geophysical and environmental warfare. The documents showed how these effects might be caused, and the negative effects on human health and thinking. The mental-disruption possibilities for HAARP are the most disturbing. More than 40 pages of the book, with dozens of footnotes, chronicle the work of Harvard professors, military planners and scientists as they plan and test this use of the electromagnetic technology. For example, one of the papers describing this use was from the International Red Cross in Geneva. It even gave the frequency ranges where these effects could occur -- the same ranges which HAARP is capable of broadcasting. The following statement was made more than twenty-five years ago, in a book by Brzezinski which he wrote while a professor at Columbia University: "Political strategists are tempted to exploit research on the brain and human behavior. Geophysicist Gordon J. F.MacDonald -- specialist in problems of warfare -- says accurately-timed, artificially-excited electronic strokes 'could lead to a pattern of oscillations that produce relatively high power levels over certain regions of the earth...In this way, one could develop a system that would seriously impair the brain performance of very large populations in selected regions over an extended period'...No matter how deeply disturbing the thought of using the environment to manipulate behavior for national advantages , to some, the technology permitting such use will very probably develop within the next few decades." In 1966, MacDonald was a member of the President's Science Advisory Committee and later a member of the President's Council on Environmental Quality. He published papers on the use of environmental control technologies for military purposes. The most profound comment he made as a geophysicist was, "The key to geophysical warfare is the identification of environmental instabilities to which the addition of a small amount of energy would release vastly greater amounts of energy." While yesterday's geophysicists predicted today's advances, are HAARP program managers delivering on the vision? The geophysicists recognized that adding energy to the environmental soup could have large effects. However, humankind has already added substantial amounts of electromagnetic energy into our environment without understanding what might constitute critical mass. The book by Begich and Manning raises questions: Have these additions been without effect, or is there a cumulative amount beyond which irreparable damage can be done? Is HAARP another step in a journey from which we cannot turn back? Are we about to embark on another energy experiment which unleashes another set of demons from Pandora's box? As early as 1970, Zbigniew Brzezinski predicted a "more controlled and directed society" would gradually appear, linked to technology. This society would be dominated by an elite group which impresses voters by allegedly superior scientific know-how. Angels Don't Play This HAARP further quotes Brzezinski: "Unhindered by the restraints of traditional liberal values, this elite would not hesitate to achieve its political ends by using the latest modern techniques for influencing public behavior and keeping society under close surveillance and control. Technical and scientific momentum would then feed on the situation it exploits", Brzezinski predicted. His forecasts proved accurate. Today, a number of new tools for the "elite" are emerging, and the temptation to use them increases steadily. The policies to permit the tools to be used are already in place. How could the United States be changed, bit by bit, into the predicted highly- controlled technosociety? Among the "steppingstones" Brzezinski expected were persisting social crises and use of the mass media to gain the public's confidence. In another document prepared by the government, the U.S. Air Force claims: The potential applications of artificial electromagnetic fields are wide-ranging and can be used in many military or quasi-military situations...Some of these potential uses include dealing with terrorist groups, crowd control, controlling breaches of security at military installations, and antipersonnel techniques in tactical warfare. In all of these cases the EM (electromagnetic) systems would be used to produce mild to severe physiological disruption or perceptual distortion or disorientation. In addition, the ability of individuals to function could be degraded to such a point that they would be combat ineffective. Another advantage of electromagnetic systems is that they can provide coverage over large areas with a single system. They are silent and countermeasures to them may be difficult to develop... One last area where electromagnetic radiation may prove of some value is in enhancing abilities of individuals for anomalous phenomena." Do these comments point to uses already somewhat developed? The author of the government report refers to an earlier Air Force document about the uses of radiofrequency radiation in combat situations. (Here Begich and Manning note that HAARP is the most versatile and the largest radio-frequency-radiation transmitter in the world.) The United States Congressional record deals with the use of HAARP for penetrating the earth with signals bounced off of the ionosphere. These signals are used to look inside the planet to a depth of many kilometers in order to locate underground munitions, minerals and tunnels. The U.S. Senate set aside $15 million dollars in 1996 to develop this ability alone -- earth-penetrating-tomography. The problem is that the frequency needed for earth-penetrating radiations is within the frequency range most cited for disruption of human mental functions. It may also have profound effects on migration patterns of fish and wild animals which rely on an undisturbed energy field to find their routes. As if electromagnetic pulses in the sky and mental disruption were not enough, Eastlund bragged that the super-powerful ionospheric heater could control weather. Begich and Manning brought to light government documents indicating that the military has weather-control technology. When HAARP is eventually built to its full power level, it could create weather effects over entire hemispheres. If one government experiments with the world's weather patterns, what is done in one place will impact everyone else on the planet. Angels Don't Play This HAARP explains a principle behind some of Nikola Tesla's inventions -- resonance -- which affects planetary systems. Bubble Of Electric Particles Angels Don't Play This HAARP includes interviews with independent scientists such as Elizabeth Rauscher. She has a Ph.D., a long and impressive career in high-energy physics, and has been published in prestigious science journals and books. Rauscher commented on HAARP. "You're pumping tremendous energy into an extremely delicate molecular configuration that comprises these multi-layers we call the ionosphere." The ionosphere is prone to catalytic reactions, she explained; if a small part is changed, a major change in the ionosphere can happen. In describing the ionosphere as a delicately balanced system, Dr. Rauscher shared her mental picture of it -- a soap-bubble-like sphere surrounding Earth's atmosphere, with movements swirling over the surface of the bubble. If a big enough hole is punched through it, she predicts, it could pop. Slicing The Ionosphere Physicist Daniel Winter, Ph. D. , of Waynesville, North Carolina, says HAARP high-frequency emissions can couple with longwave (low- frequency, or ELF) pulses the Earth grid uses to distribute information as vibrations to synchronize dances of life in the biosphere. Dan terms this geomagnetic action 'Earth's information bloodstream'., and says it is likely that coupling of HAARP HF (high-frequency) with natural ELF (extremely low frequency) can cause unplanned, unsuspected side effects. David Yarrow of Albany, New York, is a researcher with a background in electronics. He described possible interactions of HAARP radiations with the ionosphere and Earth's magnetic grid: HAARP will not burn 'holes' in the ionosphere. That is a dangerous understatement of what HAARP's giant gigawatt beam will do. Earth is spinning relative to thin electric shells of the multilayer membrane of 'ion-o-speres' that absorb and shield Earth's surface from intense solar radiation, including charged particle storms in solar winds erupting from the sun. Earth's axial spin means that HAARP -- in a burst lasting more than a few minutes -- will slice through the ionosphere like a microwave knife. This produces not a 'hole', but a long tear -- an incision." Crudely Plucking The Strings Second concept: As Earth rotates, HAARP will slice across geomagnetic flux...a donut-shaped spool of magnetic strings -- like longitude meridians (on maps). HAARP may not 'cut' these strings in Gaia's magnetic mantle, but will pulse each thread with harsh, out-of-harmony high frequencies. These noisy impulses will vibrate geomagnetic flux lines, sending vibrations all through the geomagnetic web." "The image comes to mind of a spider on its web. An insect lands, and the web's vibrations alert the spider to possible prey. HAARP will be a man-made microwave finger poking at the web, sending out confusing signals, if not tearing holes in the threads." "Effects of this interference with symphonies of Gaia's geomagnetic harp are unknown, and I suspect barely thought of. Even if thought of, the intent (of HAARP) is to learn to exploit any effects, not to play in tune to global symphonies." Among other researchers quoted is Paul Schaefer of Kansas City. His degree is in electrical engineering and he spent four years building nuclear weapons. "But most of the theories that we have been taught by scientists to believe in seem to be falling apart," he says. He talks about imbalances already caused by the industrial and atomic age, especially by radiation of large numbers of tiny, high-velocity particles "like very small spinning tops into our environment. The unnatural level of motion of highly-energetic particles in the atmosphere and in radiation belts surrounding Earth is the villain in the weather disruptions, according to this model, which describes an Earth discharging its buildup of heat, relieving stress and regaining a balanced condition through earthquakes and volcanic action. 'Feverish' Earth "One might compare the abnormal energetic state of the Earth and its atmosphere to a car battery which has become overcharged with the normal flow of energy jammed up, resulting in hot spots, electrical arcing, physical cracks and general turbulence as the pent-up energy tries to find some place to go." In a second analogy, Schaefer says "Unless we desire the death of our planet, we must end the production of unstable particles which are generating the earth's fever. A first priority to prevent this disaster would be to shut down all nuclear power plants and end the testing of atomic weapons, electronic warfare and 'Star Wars'." Meanwhile, the military builds its biggest ionospheric heater yet, to deliberately create more instabilities in a huge plasma layer -- the ionosphere -- and to rev up the energy level of charged particles. Electronic Rain From The Sky They have published papers about electron precipitation from the magnetosphere (the outer belts of charged particles which stream toward Earth's magnetic poles) caused by man-made very low frequency electromagnetic waves. "These precipitated particles can produce secondary ionization, emit X-rays, and cause significant perturbation in the lower ionosphere." Two Stanford University radio scientists offer evidence of what technology can do to affect the sky by making waves on earth; they showed that very low frequency radio waves can vibrate the magnetosphere and cause high-energy particles to cascade into Earth's atmosphere. By turning the signal on or off, they could stop the flow of energetic particles. Weather Control Avalanches of energy dislodged by such radio waves could hit us hard. Their work suggests that technicians could control global weather by sending relatively small 'signals' into the Van Allen belts (radiation belts around Earth). Thus Tesla's resonance effects can control enormous energies by tiny triggering signals. The Begich/ Manning book asks whether that knowledge will be used by war-oriented or biosphere-oriented scientists. The military has had about twenty years to work on weather warfare methods, which it euphemistically calls weather modification. For example, rainmaking technology was taken for a few test rides in Vietnam. The U.S. Department of Defense sampled lightning and hurricane manipulation studies in Project Skyfire and Project Stormfury. And they looked at some complicated technologies that would give big effects. Angels Don't Play This HAARP cites an expert who says the military studied both lasers and chemicals which they figured could damage the ozone layer over an enemy. Looking at ways to cause earthquakes, as well as to detect them, was part of the project named Prime Argus, decades ago. The money for that came from the Defense Advanced Research Projects Agency (DARPA, now under the acronym ARPA.) In 1994 the Air Force revealed its Spacecast 2020 master plan which includes weather control. Scientists have experimented with weather control since the 1940's, but Spacecast 2020 noted that "using environmental modification techniques to destroy, damage or injure another state are prohibited". Having said that, the Air Force claimed that advances in technology "compels a reexamination of this sensitive and potentially risky topic." 40 Years Of Zapping The Sky? As far back as 1958, the chief White House advisor on weather modification, Captain Howard T. Orville, said the U.S. defense department was studying "ways to manipulate the charges of the earth and sky and so affect the weather" by using an electronic beam to ionize or de- ionize the atmosphere over a given area. In 1966, Professor Gordon J. F. MacDonald was associate director of the Institute of Geophysics and Planetary Physics at the University of California, Los Angeles, was a member of the President's Science Advisory Committee, and later a member of the President's Council on Environmental Quality. He published papers on the use of environmental-control technologies for military purposes. MacDonald made a revealing comment: "The key to geophysical warfare is the identification of environmental instabilities to which the addition of a small amount of energy would release vastly greater amounts of energy." World-recognized scientist MacDonald had a number of ideas for using the environment as a weapon system and he contributed to what was, at the time, the dream of a futurist. When he wrote his chapter, "How To Wreck The Environment", for the book Unless Peace Comes, he was not kidding around. In it he describes the use of weather manipulation, climate modification, polar ice cap melting or destabilization, ozone depletion techniques, earthquake engineering, ocean wave control and brain wave manipulation using the planet's energy fields. He also said that these types of weapons would be developed and, when used, would be virtually undetectable by their victims. Is HAARP that weapon? The military's intention to do environmental engineering is well documented. U.S. Congress' subcommittee hearings on Oceans and International Environment looked into military weather and climate modification conducted in the early 1970's. "What emerged was an awesome picture of far-ranging research and experimentation by the Department of Defense into ways environmental tampering could be used as a weapon," said another author cited in Angels Don't Play This HAARP. The revealed secrets surprised legislators. Would an inquiry into the state of the art of electromagnetic manipulation surprise lawmakers today? They may find out that technologies developed out of the HAARP experiments in Alaska could deliver on Gordon MacDonald's vision, because leading-edge scientists are describing global weather as not only air pressure and thermal systems, but also as an electrical system. 'Small Input, Big Effect' HAARP zaps the ionosphere where it is relatively unstable. A point to remember is that the ionosphere is an active electrical shield protecting the planet from the constant bombardment of high-energy particles from space. This conducting plasma, along with Earth's magnetic field, traps the electrical plasma of space and holds it back from going directly to the earth's surface, says Charles Yost of Dynamic Systems, Leicester, North Carolina. "If the ionosphere is greatly disturbed, the atmosphere below is subsequently disturbed.". Another scientist interviewed said there is a super-powerful electrical connection between the ionosphere and the part of the atmosphere where our weather comes onstage, the lower atmosphere.